If this is your first time tuning in to The Creative Marketing Zone Podcast then welcome, I am super thrilled you are here! And if you are a repeat listening friend of the show then I am also ecstatic that you have chosen me to be in your ear each and every week to share some awesome creative marketing content! Tuesday’s is when I release a new interview with a marketing guru sharing his or her creative ninja marketing strategies and tactics to help you grow your business. And Friday’s is when I release a solo episode sharing something new I have learned that works, doesn’t work, or some general creative marketing advice. Today’s episode would fall under the latter category as I am discussing the pros and cons of running a podcast. Being that my show is now 60 episodes in, and I have been running this show for over a year now, I figured why not put an episode together discussing my experiences, tips and so much more. This episode is perfect for anyone who may be curious about starting their own podcast. This is also a good episode for those who are currently running their own podcast and would like a unique perspective when it comes to the pros and cons. So, let’s go ahead and jump into the nitty-gritty, shall we? First, before I jump into the pros and cons, let me provide a reader’s digest version on why I started my podcast. I learn so much from these shows, and I take action by implementing what I’ve learned back into my business. If I experience good results, then I apply these cool new creative strategies and tactics with my clients and I also share what I have learned on my podcast with own spin on everything! In early 2017, I got the itch to begin exploring starting a podcast for my business. I told myself that when I would get to my first 10 clients or my first $10k in monthly revenue, then I’d start the podcast. And this actually happened faster than I thought. So, I did what any sane person would do (I think), which was to start advertising to everyone that I was going to be starting a podcast and I set a date in which I was going to launch and go live. I actually recommend this approach when first starting out, otherwise you may never get around to launching. It was a big learning curve for me as I talk more about on this episode, but ultimately, I was able to get into a groove. I went into this with the mindset that this will be a great way for me to educate, build my personal brand, network and develop great relationships, and improve my communication skills. I also knew going in that this was going to be a long-term commitment/strategy play for me (something I discuss in more depth later) – not a get rich quick scheme. So, here are my pros and cons with podcasting – in no particular order. While it’s not the same as being published author, podcasting does have a way of creating an impression among others that you are credible. This is especially true as you become consistent with your content. If you use your platform to interview guests on the show you also build credibility. Guests who see you are up to good stuff will eventually reach out and want to be on your show. And when you reach out to folks who see you have had some good interviews already then they are more inclined to say yes to be on your show! I highly recommend using your platform to interview influencers, especially when you are first starting out. More than likely, no one knows you in the podcasting ecosystem, so why should they tune in to anything you are saying when doing a solo podcast? By bringing good guests on your show you get the added free exposure for your brand as they will be sharing the show with his or her audience. You also get to learn so much from your guests which in turn becomes super helpful for your listening friends. I cannot even begin to tell you how much I have learned just in this past year from the guests on my show. From personal branding SEO, how to drive traffic using Pinterest, SEO tips, Facebook ad strategies and so much more – it is free education! Video and audio are hot these days, and both are not going away anytime soon. However, there are two main advantages of audio podcasts have over video. First, listeners can literally tune in wherever they are. They could be walking their dog, grocery shopping, working out, driving, in the shower, doing dishes, climbing Mount Everest (you never know). You are in their ear regardless of location. The second advantage podcasting has over video is that the attention span of podcast listeners is a lot longer than those watching videos, including videos on YouTube. Last I checked, the average watch span of YouTube videos is around the four to six-minute range. However, when it comes to podcasting, the average listening time is much higher. You can get your listeners to tune in to 20, 40, 60 or even 90 minutes and higher with your shows. The key ingredient, of course, is producing good content and being consistent. Here are some cool stats worth checking out. This is your platform, so you can put in a plug for a product you are selling, or a service offering you have available. If you don’t have anything to sell yet, then you can plug in some affiliates relevant to your audience. Most people start a podcast thinking about the possible monetization that is out there from sponsor deals. Yes, there is companies’ spending money to have their products and services being sponsored on shows. But to command this, you have to be getting upwards of at least 20k monthly downloads, and you need to share some other important metrics as well. They are not just going to cut you a check to say a few things about their product with no data to support why they should be paying you. While the sponsor route is definitely doable, this rarely happens overnight. The better approach to take is to think of ways you can use your platform to creatively announce your product and service offerings, or affiliate links. Not only do you have more control over what you can and cannot say, but you can also make a TON of more money going this route! I mentioned earlier that you can build your credibility and authority in this space through podcasting. And you can grow your business by advertising your products, services, or affiliates. In reality, however, I have seen the biggest return back into my business by treating my platform as a networking and business development tool. When I reach out to potential guests I want to interview on the show, I spend time researching what these folks are up to. Are they providing something cutting edge with their marketing approach? Do they have access to my target audience of listeners? Could they become a good teaming partner – e.g. someone I can trust to pass referrals to and potentially get referrals or subcontract work from? I have referred business to guests on my show. I have also received business as well. Podcasting, if done right when interviewing guests on your show, can be a great networking opportunity to grow your business without you having to spend thousands of dollars attending networking events. I have also received referral guests to be on the show. One last thing to point out is that over time podcasting (similar to YouTube) is a great way to build and grow your community (your brand). I record my episodes on Skype and write my own show notes for each episode, which is housed on my website. Many podcasters fall for the mistake of just producing good content without the episodes being available on their website. This is a HUGE missed opportunity for many reasons – two in which I will point out below. First, you are missing a big SEO opportunity. Take this post for instance. It may not be the perfect SEO example, but it does include keywords, phrases, a conversational tone with the writing, and internal links and backlinks to external websites. Ask any SEO professional and they will tell you that these are critical components to have for good SEO content on your website. The other major missed opportunity is the traffic you are missing to your website and the data you can collect and analyze from Google (Google Analytics). I monitor my data each month (sometimes weekly) to see the traffic levels keep growing, top content, keywords that are producing results, and audience insights and demographics. The funny thing is for a while I thought my audience was primarily a male audience. However, when studying Google Analytics, the opposite is true. Most of the listeners of this (dare I saw awesome) show are female between the ages of 25-34 who are into marketing, business, advertising, and fashion. I also have a lot of transformational coaches and marketers who work for companies tuning in as well. Another great potential missed opportunity which I may be exploring more of in 2019 is repurposing the content into a video for people to watch and listen. I interview all my guests on Skype and Skype version 8 now allows you to record video and audio for free! Once the call is over you can download the Mp4 file. Pretty cool, right? Okay, so I admit, my first I want to say 20 (maybe even 30) episodes I was a nervous wreck. I remember my very first episode freaking out before I jumped on to do an interview with someone. I was sweating under my armpits – big time! The guests I had on the show were awesome! But I was far from being awesome. I had way too many ums, and my voice was not loud enough. Plus, when asking the questions, I seemed to be scripted – now everything seems to be a bit more conversational and fun. Now don’t get me wrong, I still say things awkwardly, and never is there such a thing as a perfect episode. But I have made slight improvements each week to make the show better. I had the same issue with video before. But just like with anything, the more you practice the better you get. And when it comes to podcasting and video the same holds true. Everyone struggles in the beginning. Just get started and focus on getting better over time. This is my final pro, which is another good one worth mentioning. When you commit to a publishing schedule you must deliver! Being that I am on a Tuesday and Friday publishing schedule currently, I am on the hook to produce, publish and promote good content twice per week. I have been called out before when I was off by a day. The key is to pick a topic you are passionate about and keep having fun in this realm. Also, always keep in mind that the work you are doing by producing and sharing good content is worth it – even if just one person takes action. You are doing this for the greater good. You can’t get by with just pushing a record button on your phone or laptop then publishing your episode. You have to come up with good content, record, edit, publish, promote, and repeat. And if you are interviewing people to be on your show, then this is an even bigger time commitment. Reaching out and scheduling initial phone screening calls with potential guests to be on the show. I am now getting more people requesting to be on the show so I have to screen them out on this phone call after doing some research on them. This process keeps getting refined over time. But on average I spend a good 10-15 hours each week with these activities (some weeks may be more depending on how many interviews I have lined up). I do recommend batching as much as possible, especially with the interviews. There is nothing worse than being in a position of having to scramble each week for a guest to be on your show. I typically keep a minimum of 3-4 weeks of interviews already recorded waiting to be edited in the pipeline. I also recommend hiring a good virtual assistant to edit your shows, do your show notes, and maybe even reach out to potential guests to be on your show. If you need a good virtual assistant then let me know – I have an awesome one who has been with me for close to two years now. She is in the Philippines and does great work! I hear people all the time saying to me that the podcasting market is oversaturated. What many people fail to realize, however, is that the average podcast listener is subscribed to at least seven shows, and they tune in each week to new content being published. Plus, not everyone is up-to-speed about podcasting. Many people still ask me “what is a podcast?” I also get asked a lot about what the podcasting hype is all about. One other stat worth mentioning that really hits the nail on the head here is that most people give up with their podcast around the 20 episode mark. They realize just how much of a time commitment is involved with running a show each week and they aren’t seeing immediate results when it comes to the downloads. Podcasting, just like with YouTube and blogging, is a long-term play. You have to show up each and every week to produce, share and promote great content. There is no bypassing or a cheat code to avoid this. As the saying goes, if it were easy everyone would be doing it, right? Same holds true in podcasting land. This must be a long-term commitment that is a part of your business to grow your brand. And you must be passionate and have fun with it! Otherwise, you will burn out and drop off like everyone else. Podcasting is an ongoing learning journey. If you are someone who does not like to learn new things on your own, spend Friday nights watching tutorials, or entire weekends tweaking your show, then podcasting may not be for you. The good news, however, is that there are tools, platforms, and resources that make your job as a podcaster much easier with hardly any cost. For instance, the microphone I now use (which I highly recommend) is the Audio-Technica ATR 2100. This microphone is badass – and it only cost around $80 (no audio mixer required)! Simply plug in your mic into the USB port of your desktop or laptop PC and you are good to go. This mic is also a great travel companion. 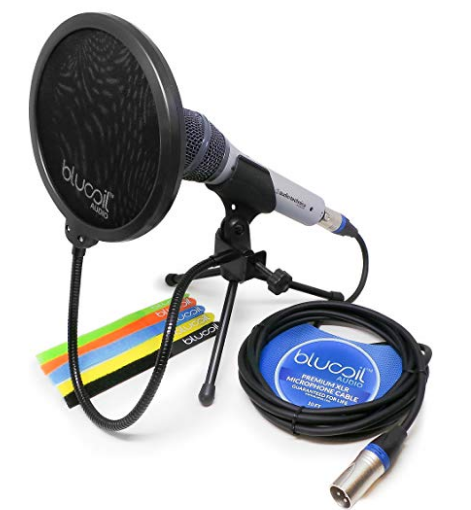 You can easily pack this with you and go record wherever you need to record from. Skype or Zoom are both great platforms to record your interviews, and audacity is a great free editing software you can use. Pat Flynn has a good audacity training video, which comes from his podcasting course. Libsyn is also another essential. This is a great hosting platform that syncs up with just about all the podcast listening playing platforms out there. When you upload your final edited mp3 audio file to Libsyn and go through the series of simple steps to publish your episode, the podcast players such as Apple Podcasts or iTunes will pull the content from your Libsyn RSS feed. You don’t need to go into all the different platforms and upload your show. A big mistake podcasters make is that they produce good content but fail to spend time promoting the show. This isn’t Field of Dreams – you don’t just produce good content and expect people to start flocking your way. Nor can you produce a great episode then do a simple LinkedIn update, tweet, and Facebook post and call it a day. You have to literally spend more time promoting your show then it took for you to create and publish the episode. And you need to experiment as well. For instance, I routinely experiment running sponsored Tweets, Facebook and Instagram posts, and LinkedIn posts to drive traffic to my episode on the show notes page. Twitter I tend to get the biggest bang for my buck as I can literally spend $10 over 7 days and target the lookalike followers of a mega influencer like Amy Porterfield. This produces hundreds of clicks. You also have to participate in comments and discussions online, do Instagram Story videos, send emails out to your email lists and spread the message about your podcast EVERYWHERE (not just online). The good news is that if you are interviewing good guests on your show then they will also promote to their audience creating great free exposure for you and your podcast. So there you have it, everyone! My pros and cons based on experience running a successful podcast. If podcasting is something you are interested in pursuing then let me know! Email me here and let’s connect. I’d be more than happy to help or at least point you in the right direction. Our next featured interview guest on Tuesday is Frank Goodman, founder of Bleeding Bulb. During the fun conversation I had with Frank, we talked about the importance of focusing less on vanity metrics online to grow your business when you are first starting out – simply because followers won’t pay your bills. We talk about ways to overcome this mindset and how you can leverage social media to start paying your bills today! Thanks as always for tuning in everyone!